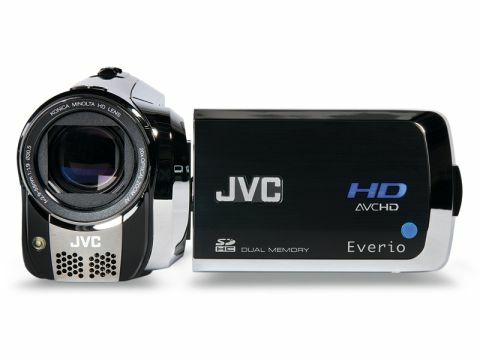 Does JVC's Everio GZ-HM200 do the job for casual shooting? This handful of silver and black will easily slip into a handbag or an inside coat pocket. Its small and dainty controls are not designed for the serious videographer, but it has the HD spec and features to enable casual users to snap and video high quality images. While the lens and stereo Dolby Digital speakers seem a little puny, it does sport an impressively large 20x optical zoom. Most modern camcorders plaster their megapixel credentials all over the body, but the 3MP modes available here are tucked away in the manual. Component, AV and USB leads are included as accessories, along with a remote control, but there's no cable for HDMI. For its target audience, the HM200's pictures are far better than what you'd expect from its equivalent models in the past. But for HD, there's very little to shout about and the pictures are certainly no better than that served up by decent models on supposedly more primitive formats. Both video and stills are lacking the detail of fellow hi-def models and only impress in optimal shooting conditions. Images also tend to look a little washed out. Audio is okay, if a little bright and harsh and there is some interference from handling noise. The auto functions are a little slow to react, but do a decent enough job. The whole package is fine for those on a budget who are not worried about the best pictures. For the rest, you're not getting close to what HD can really offer.